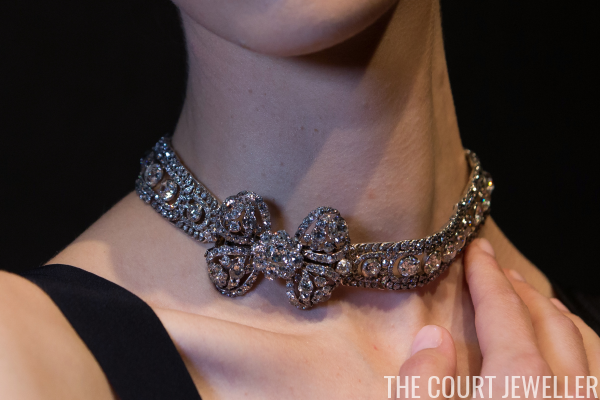 For the second time in eleven years, an important diamond bow necklace from the Russian imperial collection will be sold at Sotheby's. The necklace is thought to have been worn by one of the most important figures in Russian history: Catherine the Great. 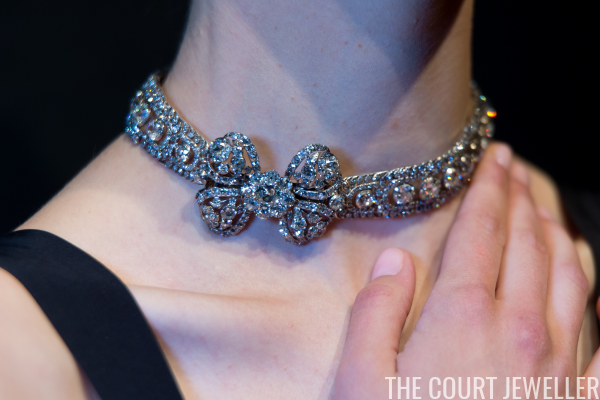 Sotheby's previewed the piece in London on Tuesday, giving us a close-up glimpse of the dazzling necklace. The necklace, which dates to the second half of the eighteenth century, will be sold at Sotheby's Magnificent Jewels auction in Geneva on November 16. It was previously sold at the same location almost exactly eleven years ago, on November 17, 2005. The lot notes for that auction described the piece as a "necklace consisting of an articulated band mounted in silver with a row of twenty-seven graduated cushion-shaped diamonds in open settings within a border of stylised foliate motifs close set with smaller similarly cut stones, embellished with a ribbon bow clasp close set in silver with cushion-shaped diamonds in an open-work floral and foliate pattern." Diana Scarisbrick produced an extensive catalogue note for the piece on its last auction appearance. 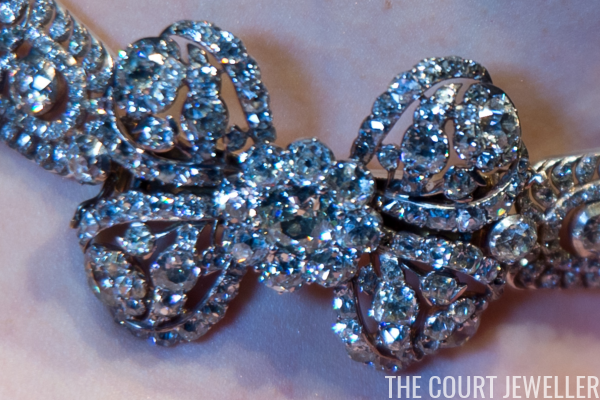 She explains that "this diamond necklace with bowknot clasp is not only a remarkable jewel in itself, but its Russian royal provenance puts it in a class of its own. It evokes the blinding splendour of Catherine II, Empress of Russia: the magnificence of her court, her parks, her palaces, her art collections, and monuments." It's believed that the necklace was made specifically for Catherine, but the provenance is only firmly linked to the Russian imperial collection of the time. It resided in the Diamond Fund until the 1917 revolution. 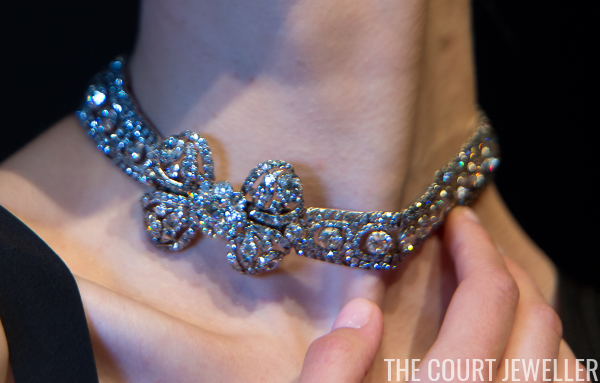 The necklace sold in 2005 for $1.5 million, just under the high end of the auction estimate. At the time, Sotheby's executive director told the Associated Press that it was the "most important historical necklace" sold at Sotheby's in three decades. The necklace is a rare relic of its era; we know how many pieces from the 1700s were broken up or reworked to suit later fashions. Sotheby's noted in 2005 that the survival of an eighteenth-century jewel "is almost unheard of outside royal or museum collections." 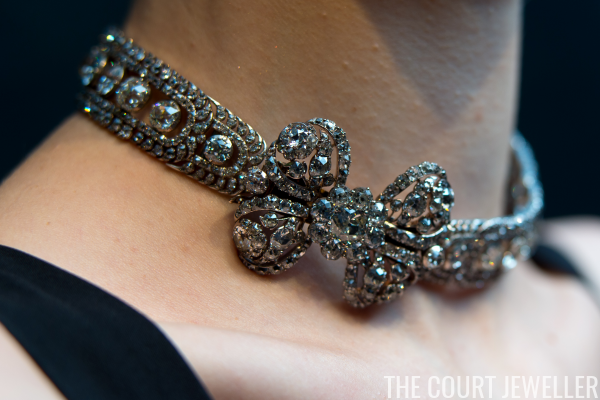 This time around, the auction house is anticipating an even bigger result from the necklace's sale. Detailed lot notes have not yet been released, but the auction estimate appears to have been set at between $3 and $5 million.